Shortly after his literary debut with The Reconstruction Is Greater Martin Hall was invited to participate in the anthology Pearls before Swine, a book released in December 1983. 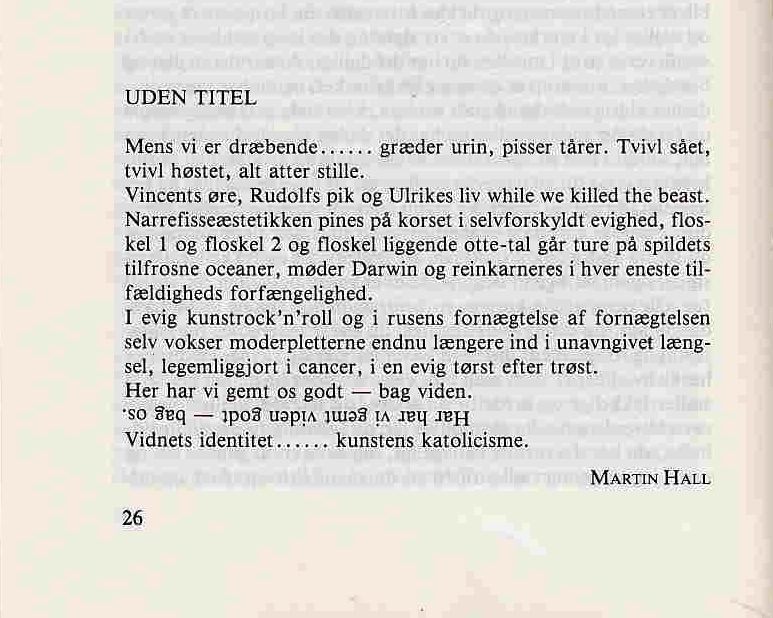 Hall’s contribution to the anthology is the text “Uden Titel” (“Untitled”). Pearls before Swine was published in 400 copies in relation to a Danish exhibition called Tale og Tavshed (Speech and Silence) at Galleri Sct. Agnes (15.12.1983–10.1.1984). The anthology was edited by Jan Wolff. The book opens with the following quotations: ”Alles Geschriebenes ist Schweinerei” (G. Baselitz) and ”When one realizes the psychic basis of the artist, one is repelled” (T.W. Adorno). 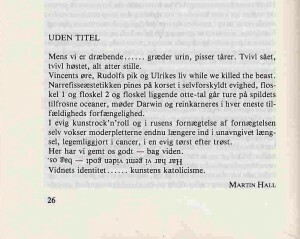 Apart from several illustrations made by Danish painters such as Knud Odde and Lars Ravn, the selected writings in the book contain pieces by Gertrude Stein and Asger Jorn as well as newly written material supplied by Peter Laugesen, Peter H. Olesen, Claus Carstensen, Odd Bjertnaes, T.S. Hoeg and several others.